Modern videoconferencing such as Skype over the Internet allows an interview coach to assist a young woman before a hypothetical college interview despite the distance. An interview is a conversation where questions are asked and answers are given. In common parlance, the word "interview" refers to a one-on-one conversation between an interviewer and an interviewee. The interviewer asks questions to which the interviewee responds, usually so information may be transferred from interviewee to interviewer (and any other audience of the interview). Sometimes, information can be transferred in both directions. It is a communication, unlike a speech, which produces a one-way flow of information. Interviews usually take place face-to-face and in person, although modern communications technologies such as the Internet have enabled conversations to happen in which parties are separated geographically, such as with videoconferencing software, and telephone interviews can happen without visual contact. Interviews almost always involve spoken conversation between two or more parties, although in some instances a "conversation" can happen between two persons who type questions and answers back and forth. Interviews can range from Unstructured interview or free-wheeling and open-ended conversations in which there is no predetermined plan with prearranged questions, to highly structured conversations in which specific questions occur in a specified order. They can follow diverse formats; for example, in a ladder interview, a respondent's answers typically guide subsequent interviews, with the object being to explore a respondent's subconscious motives. Typically the interviewer has some way of recording the information that is gleaned from the interviewee, often by writing with a pencil and paper, sometimes transcribing with a video or audio recorder, depending on the context and extent of information and the length of the interview. Interviews have a duration in time, in the sense that the interview has a beginning and an ending. The traditional two-person interview format, sometimes called a one-on-one interview, permits direct questions and followups, which enables an interviewer to better gauge the accuracy of responses. It is a flexible arrangement in the sense that subsequent questions can be tailored to clarify earlier answers. Further, it eliminates any possible distortion by having third parties present. Face to face interviewing makes it easier for people to interact and form a connection, and it helps both the potential employer and potential hire who they might be interacting with. Further, face to face interview sessions can be more enjoyable. Employment. Interviews in an employment context are typically called job interviews which describe a formal consultation for the purpose of evaluating the qualifications of the interviewee for a specific position. Interviews are seen as a useful tool in assessing qualifications. A specific type of job interview is a case interview in which the applicant is presented with a question or task or challenge, and asked to resolve the situation. Sometimes to prepare for job interviews, candidates are treated to a mock interview as a training exercise to prepare the respondent to handle questions in the subsequent 'real' interview. Sometimes the interviews happen in several waves, with the first interview sometimes being called a screening interview which is a shorter length interview, followed by more in-depth interviews later on, usually by company personnel who can ultimately hire the applicant. Technology has enabled new possibilities for interviewing; for example, video phoning technology has enabled applicants to interview for jobs despite being in different cities or countries than the interviewer. Psychology. Psychologists use a variety of interviewing methods and techniques to try to understand and help their patients. In a psychiatric interview, a psychiatrist or psychologist or nurse asks a battery of questions to complete what is called a psychiatric assessment. Sometimes two people are interviewed by an interviewer, with one format being called couple interviews. Criminologists and detectives sometimes use cognitive interviews on eyewitnesses and victims to try to ascertain what can be recalled specifically from a crime scene, hopefully before the specific memories begin to fade in the mind. Research. In marketing research and academic research, interviews are used in a wide variety of ways. Interviews are often used in qualitative research in which firms try to understand how consumers think. Consumer research firms sometimes use computer-assisted telephone interviewing to randomly dial phone numbers to conduct highly structured telephone interviews, with scripted questions and responses entered directly into the computer. Journalism and other media. Typically, reporters covering a story in journalism conduct interviews over the phone and in person to gain information for subsequent publication. Reporters can interview political candidates on television shows. 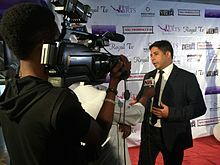 In a talk show, a radio or television "host" interviews one or more people, with the choice of topic usually being chosen by the host, sometimes for the purposes of entertainment, sometimes for informational purposes. Such interviews are often recorded and some of them can be released on an interview disc. Other situations. Sometimes college representatives or alumni conduct college interviews with prospective students as a way of assessing a student's suitability while offering the student a chance to learn more about a college. Some services specialize in coaching people for interviews. Embassy officials may conduct interviews with applicants for student visas before approving their visa applications. ^ "Introduction to Interviewing". Brandeis University. Retrieved 2015-05-02. ^ Rogers, Carl R. (1945). Frontier Thinking in Guidance. University of California: Science research associates. pp. 105–112. Retrieved March 18, 2015. ^ "15 Tips on How to Nail a Face-to-Face Interview". blog.pluralsight.com. Retrieved 2015-11-05. ^ Dipboye, R. L., Macan, T., & Shahani-Denning, C. (2012). The selection interview from the interviewer and applicant perspectives: Can't have one without the other. In N. Schmitt (Ed. ), The Oxford handbook of personnel assessment and selection (pp. 323-352). New York City: Oxford University. ^ "The Value or Importance of a Job Interview". Houston Chronicle. Retrieved 2014-01-17. ^ Polak, L; Green, J (2015). "Using Joint Interviews to Add Analytic Value". Qualitative Health Research. 26 (12): 1638–48. doi:10.1177/1049732315580103. PMID 25850721. ^ Memon, A., Cronin, O., Eaves, R., Bull, R. (1995). An empirical test of mnemonic components of the cognitive interview. In G. Davies, S. Lloyd-Bostock, M. McMurran, C. Wilson (Eds. ), Psychology, Law, and Criminal Justice (pp. 135-145). Berlin: Walter de Gruyer. ^ "BLS Information". Glossary. U.S. Bureau of Labor Statistics Division of Information Services. February 28, 2008. Retrieved 2009-05-05.